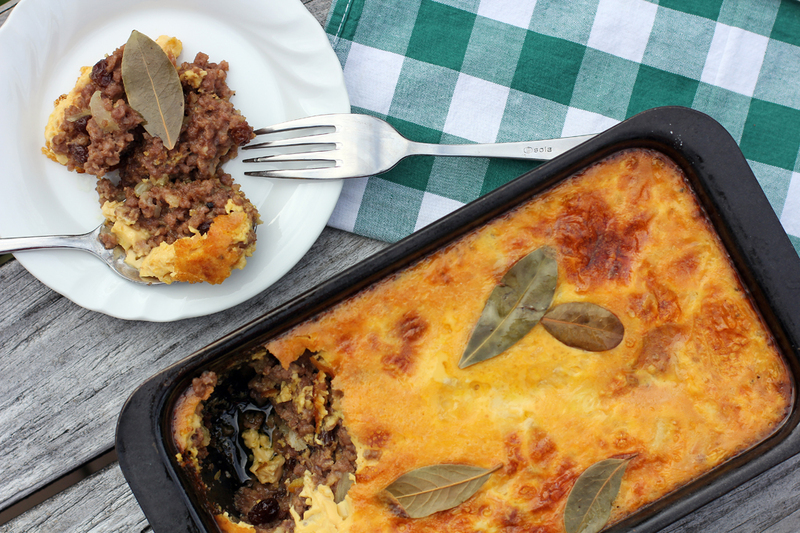 Bobotie or bobotjie is a South African dish made out of minced meat such as lamb, pork or beef mixed with different herbs and spices, dried fruits and an egg topping. For me the best way to describe is it a spicy curry flavoured meatloaf with savoury custard topping. This recipe had originated from the Indonesian dish called bobotok and was taken to South Africa during the 16th century by Indonesians aboard Dutch East India Company’s ships that transported Spices and Malay slaves to South Africa. The Malays and Indonesians traditionally used leftover meat from Sunday dinners and used it for their bobotok dishes. As time passed by the South Africans took note and adopted the recipe to locally available ingredients and what was known as bobotok slowly transformed into the traditional dish now known as bobotie. Earlier adaptation of this dish was from the Cape Malay community and it was made with curry powder and served with sambal. It then became really popular in the Cape of Good Hope during the 17th century, the popular meat used during those days was a mixture of mutton and pork. The meat then slowly changed to beef and lamb then was introduced by South African settlers to different African regions such as Kenya, Botswana, Zimbabwe and Zambia then the rest was history. Soak bread in ½ cup of milk, set aside. Add garlic, curry powder, cloves, cayenne, allspice and 3 pcs bay leaves, cook until fragrant. Add the beef, sultanas and jam then cook until beef changes colour while continuously stirring for around 10 minutes. Add the soaked bread then mix well until bread is well incorporated to the meat mixture. Turn heat off then remove the cloves and bay leaf from the mixture. In a bowl mix together 1 cup milk and 2 eggs, set it aside. Place meat mixture in a baking tray then press to compress. Pour egg mixture on top, add some bay leaf then place in a 180C preheated oven and bake for 40 minutes. I’ve eaten this once before years ago,but it seemed ordinary to me. Obviously not a good rendering on that one. YOURS, on the other hand sounds GREAT, with LOTS of flavor. I look forward to trying this soon. What an interesting dish! Looks delicious! And thank you for the history lesson! Hello Reymund, you know when I saw the title, I immediately think Bobota a kind of corn floured sweet pie but it has nothing to do with it.. Now this dish is evenly delicious! Being born and bred South African, it is quite odd that I don’t make this – seems it was more the Afrikaans people who made this as a staple. Beautifully made Raymund. Loving all those spices!! Yum!! Didn’t know about this Indonesian inspired dish! Looks great Raymund! Well isnt this interesting!! I’m loving the ingredients…Great history lesson here! Great recipe! I never tire of egg dishes. This is a new one to me. Looks wonderful. So interesting! I love meat and fruit dishes. This was one of the first dinner party casseroles I loved to prepare as a very young bride! A very long time ago 🙂 ! Up to today I did not know it originally came from Indonesia!! Personally I always make it with lamb mince and am used to adding a grated apple instead of jam [See Time-Life books, Foods of the World, African Cooking, 1970: a wonderfully accurate compendium]. Also, tucking 4-5 orange or lime leaves in amongst the top of the mixture instead of the more pungent bay leads to a wonderful flavour!!!!! I’ve never heard of this dish and from your photo I thought it was a shepherds or cottage pie. I guess it’s a good one if you’re trying to cut down on potatoes and increase your protein. The addition of mango or orange jam sounds great! I wonder if it would be wrong to serve this with a green salad? Can you believe that the first time I tasted bobotjie is at a KLM flight? Hardly the real thing, but guess what? It piqued my interest in this South African dish. Would love to make this with your recipe! Thanks for sharing. this is so pretty- I love the crust! I think we need to pick South Africa to cook from next. This sounds delicious! I never would have thought to combine meat with dried fruit. It looks very comforting. I don’t think I’ve tried South African dish in my life. Very unfortunate. It sounds like a nice comfort food! I’d love to try this with some lamb – it sounds so savory with the mix of ingredients plus the hint of sweet from the raisins and mango jam. You have made my husbands day, I made this dish some 3years ago, I found the recipe in a free supermarket magazine but I think it was just called savoury or spicy mince. I would never have guessed it was South African. I made it several times and then lost the torn out recipe. Every time I ask my husband what he would like me to do with the mince he says make that eggy strudel pie thing. I have tried to remember how to make it several times but I have never got it quite right. I can see this will be a regular winter warmer again now. Thank you so much just off to buy the ingredients and pick the bay leaves .